Facebook has billions of members and was perhaps the greatest information dissemination tool ever created. Far from its stocks perch of July 2018 FB hasn’t been able to control the narrative and the fundamentalist claim this has caused the stock price to plummet. The company tensions are playing out in the mass media with corporate leadership denials, tension, finger-pointing and even testimonies in front of Congress. After some 150 million Americans were exposed to the disinformation campaign of the Russian internet troll farm, Internet Research Agency crisis, FB wasn’t quick to come clean. Now Facebook is in crises mode trying to turn sentiment to not only the American public but to the entire world. The latest event happened last week when the news came out that the company hired Definers Public Affairs to downplay public statements and deflect public scrutiny onto rival tech companies. FB has since ended the relationship this week. It seems like one issue after the other. The events described above can definitely be part of the landscape of fundamental reasons that we now see such a decline in Facebook’s stock price. We haven’t even mentioned anything financially related. It’s simply how the masses currently “feel” about Facebook. I want to shift gears now and talk for about what we see are the technical reasons for the decline. This social network company held the initial public offering May 18, 2012. Since then we can see an advance in 5 waves from that day. 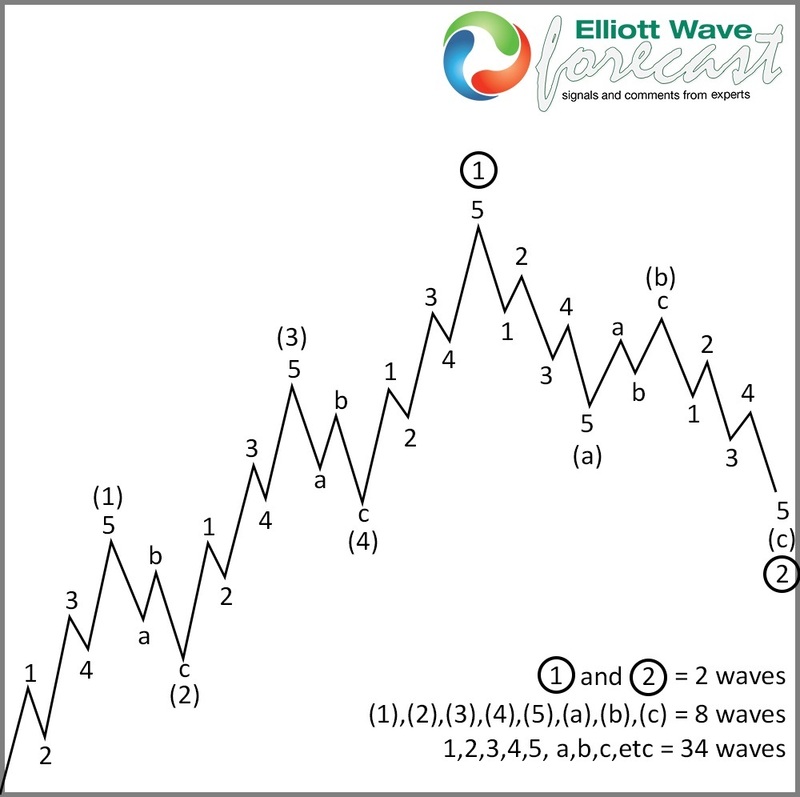 The Elliott Wave Theory states that after a 5 wave advance then the instrument of analysis should regress in 3 waves lower. That sequence of 5 waves higher and 3 waves back lower is where we are now with regards to FB. The following chart shows the Elliott Wave Theory pattern of progression and regression for reference. The Following chart show Facebook price action and showing the 5 waves advance and now 3 waves back. 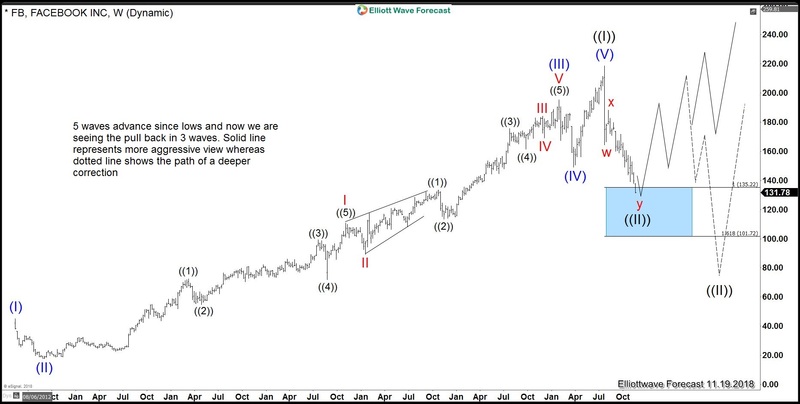 The Blue Box highlighted in the chart above encompasses a range from 135.22-101.72 and it is the area in which the 3 wave regression lower can be ending. We use these extreme areas to look for inflection points in terms of price reaction or to reverse a prior trend. In the case of FB it is in the area to look for a bottom. From the current price lows, we should see a bounce higher and also now is the time to expect the Fundamental analysis to align with the aforementioned brief primer on the technical. Something will happen to justify the coming bounce in terms of an “event”, “news”, or some other fundamental based “feeling”. In our view the Market’s nature advances in either 5 or 3 waves, but when it corrects it is always in 3, 7, or 11 waves. The question now is this decline all we will see? Or, is this the beginning of a deeper pullback and we will now only experience a 3 wave bounce higher that ultimately reverses in extension of another precipitous decline into the $80.00-60.00 area? As we always say, nobody knows exactly what the future will bring. While it is evident that the possibility of huge decline is viable, knowing The Market Nature is the ultimate key. Buying FB within this box can be an unique opportunity that one should at least can expect a tradable bounce higher. If the bounce fails then there will be an even a greater opportunity lower. The reality is that the fundamental reason for lower price action is getting crowded and one-sided. The technicals are telling us that the company is about to stabilize and a solution to the current crises is on the horizon. Let’s see what happens!